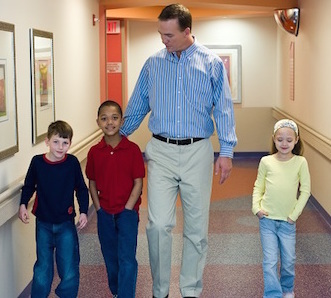 ThinkFirst – Peyton Manning Children’s Hospital is a ThinkFirst Injury Prevention Chapter for this national program. We sponsor community and school programs on bike riding safety, water safety, seat belt safety and many other topics. Our nurse educators can be scheduled to talk to school, church and community groups about how to play safely and prevent brain and spinal injuries. To download and complete the Parental Consent for Medical Treatment click here. When your child (under the age of 18) is under the care of others, use this form to provide proper consent and medical information when medical attention is needed. This Parental Consent for Medical Treatment form not only gives a caregiver permission to treat your child, it also provides valuable health facts and any other special information about your child’s medical history. Separate forms are needed for each child. Give a copy of the completed form to the person responsible for caring for your child. Send this form along with your child whether it’s to a camp or community program or to a friend’s house. 4KidsHealth is a free smartphone app from St.Vincent and Peyton Manning Children’s Hospital. This app includes a symptom checker, quick parent advice, first aid primer, and medication dosage tables. Upload family medical contacts and connect directly to 911, your child’s doctor, or the Hilbert ER department at Peyton Manning Children’s Hospital. What to do about Fever? If your child is sweaty, then cold, then sweaty again, if he or she is lethargic, flushed, and has no appetite, take the child’s temperature; it is probably fever. Fever means the body’s elevated temperature is working to fight off infection or illness like colds, flu, ear infections, and croup to name a few. Always keep your child hydrated, in bed resting and give a fever reducer like acetaminophen or ibuprofen (not aspirin). Be sure to call your child’s doctor if your child has had a fever of over 101 degrees for three days.